Kevin and I are both still sick, so we didn’t do our usual Thursday night with the boys. 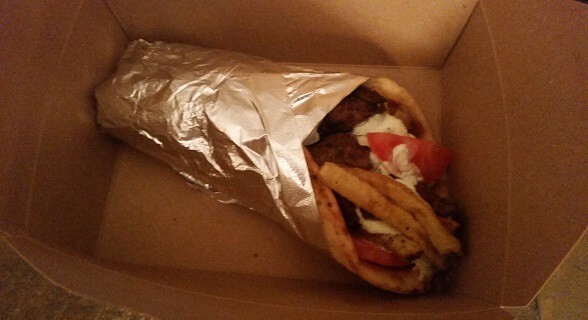 Instead, we ordered in dinner for us both, and watched an episode of “Doctor Who.” He got the bulgogi and kimchi calzone this time, and I got a pork souvlaki wrap. When I’m in good health, I eat the whole thing and look for dessert but today, although it is just as delicious as usual, I have less appetite. 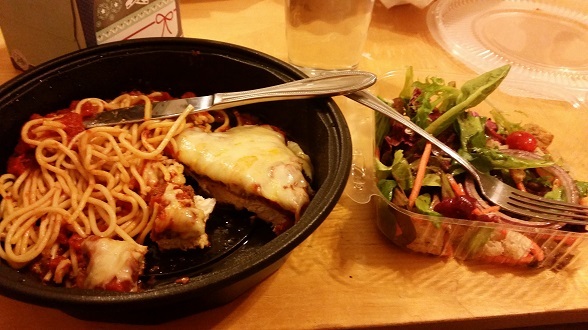 The chicken parmigiana from Fitzwilly’s is pretty good. Comes with spaghetti and a salad. You haven’t heard from me for quite awhile for one simple reason, I haven’t cooked since the last time I posted. I’ve cooked breakfast, lunch, frozen dinners, and microwave popcorn but I haven’t cooked a complete homemade dinner this whole time. You know what else, I’m not feeling all that guilty about it. I’ve had some good sushi, pizza, and Italian food so don’t worry about my health. All is good. No picture tonight. 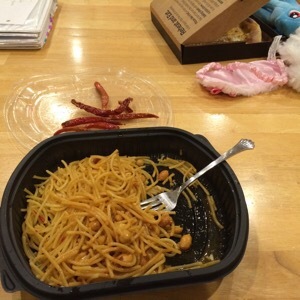 We went to Sid’s for the weekly gathering this week, and ordered take out from a local place that serves typical American restaurant fare. Kevin and Dave got Thai lettuce wraps and Sid and I got barbecue plates. Mine was brisket with mash and coleslaw. The brisket was served with two slices of white bread, and a piece of cornbread studded with something green that I really hope was jalapeno. I had a bite of it but couldn’t get over the unappealing color long enough to put down another serving of starch. White bread is just the thing under sliced, braised meat and thick gravy, though, even the sweet kind. 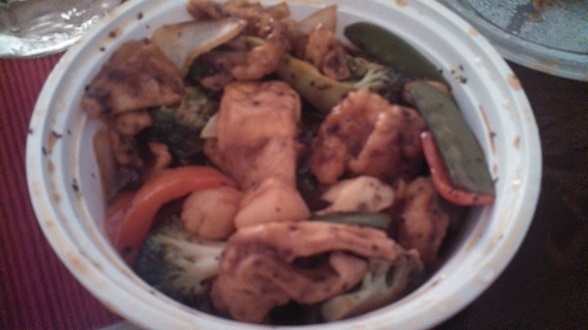 Take out from Teapot. I like the “Basil delight,” one of their specialty entrees, with chicken, shrimp, and scallops, and short grain brown rice. Dave and I drank Old Fashioneds. After dinner we all had ice cream sandwiches.